A few months ago, as I was doing a celebratory dance after purchasing the last four shadows and completing my Addiction eyeshadow collection, the brand goes ahead and announces a total overhaul of their shadows...just once, can a girl ever catch a break?! In lieu of the Addiction's upcoming August 7th release of the brand's new and revamped, 99 shade eyeshadow lineup, I'm going to post in four installments, swatches of the Addiction eyeshadows in my collection (80 in total). 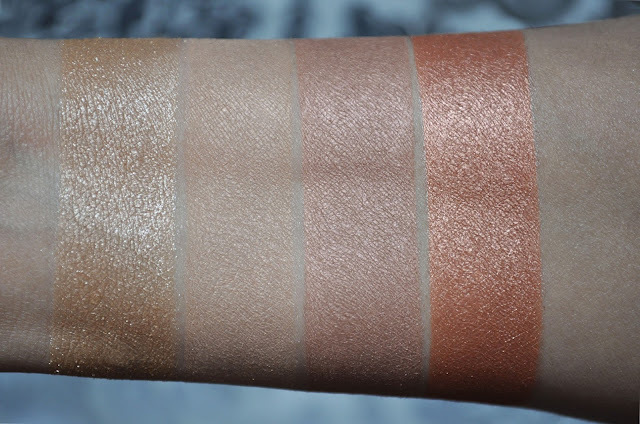 Addiction eyeshadows come in four finishes: Matte (M), Metallic (ME), Pearl (P), Sparkle (S). From left to right: Paper Doll 001M, Sugar Angel 002P, Snow Magic 003S, Snow Bouquet 004S. Paper Doll 001M: a snow white. Sugar Angel 002P: a wedding dress-white. Now, the next four shadows are categorized as "Sparkle." But, instead of having a dry texture, they have a petroleum-like-gel consistency. 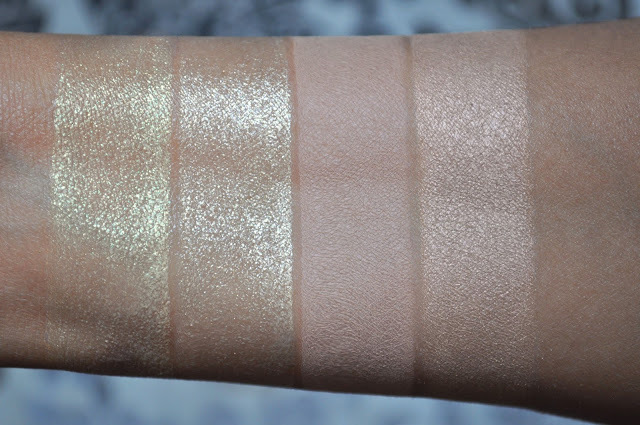 These are some of the shades going bye-bye; a shame because, whether worn alone or over another shadow, they add a mesmerizing, multidimensional sparkle to the lids. Snow Magic 003S (discontinued): a semi-gray-clear base, loaded with silver and gunmetal glitter. Snow Bouquet 004S (discontinued): a semi-pink-clear base, loaded with silver, pink and red glitter. From left to right: Snow Bird 005S, Snow Venus 006S, Beige 007M, Ice Wall 008ME. Snow Bird 005S (my favorite of the four, and discontinued): a semi-chartreuse-clear base, loaded with silver, yellow-gold, lime-green and baby pink glitter. 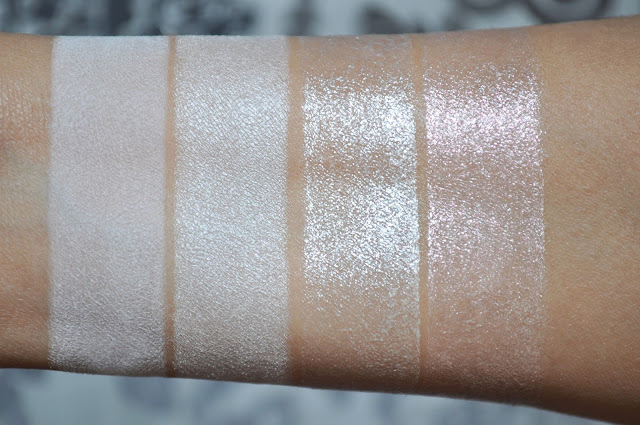 Snow Venus 006S (discontinued): a semi-platinum-clear base, loaded with silver, gold and platinum glitter. Beige 007M: just that, beige. Ice Wall 008ME: a pearlized-beige. From left to right: Sandcastles 009P, Magic Flute 010P, Sandbar 011P, Rigoletto 012ME. Sandcastles 009P: a pale, muted, mustard-yellow. Magic Flute 010P: a pale, wheat-yellow. Sandbar 011P: an icy, pale, pinkish-peach-flesh-tone. 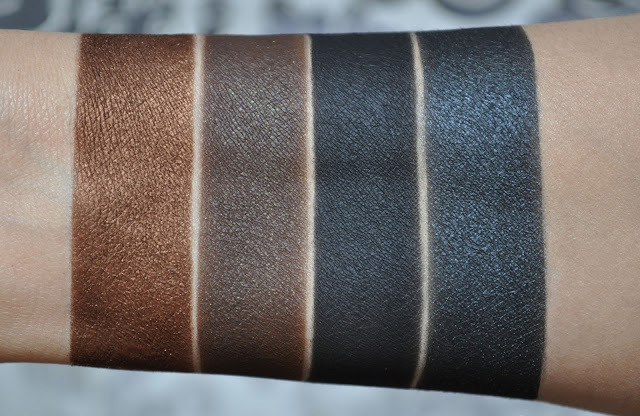 From left to right: Truffle 013M, Chocolat 014M, Nostalgia 015P, Dolce Vita 016P. Truffle 013M: a muted, mauvish-berry-reddish brown. Chocolat 014M: ochre-based brown with tiny gold sparkles. Nostalgia 015P: a warm, taupe-brown with tiny silver glitter. Dolce Vita 016P: golden-yellow-based, antique-brown, with copper and gold shimmer. From left to right: Fudge 017ME, Bagdad Cafe 018P, Joker 019M, Keshi 020P. Fudge 017ME: a deep, rusty-brown with copper shimmer. Bagdad Cafe 018P: an ash-bark-brown with gold and copper shimmer. Keshi 020P: a deep graphite with blue shimmer. 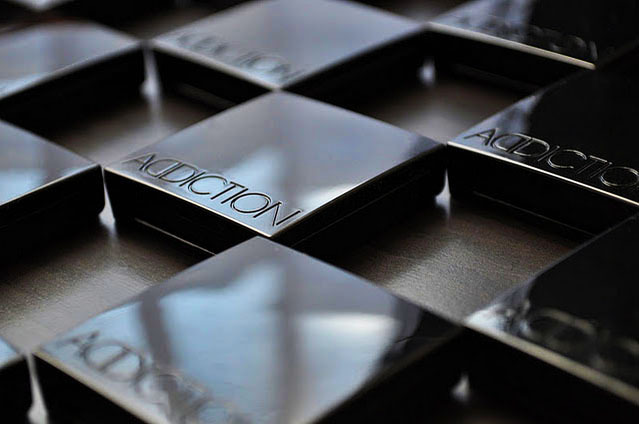 Addiction eye shadows contain 1.2g of product and retail for 2,160 yen. I hope you enjoyed the first installment of my Addiction eyeshadows. If you have any questions, please feel free to email or tweet me. Ooooooooh they're amazing! 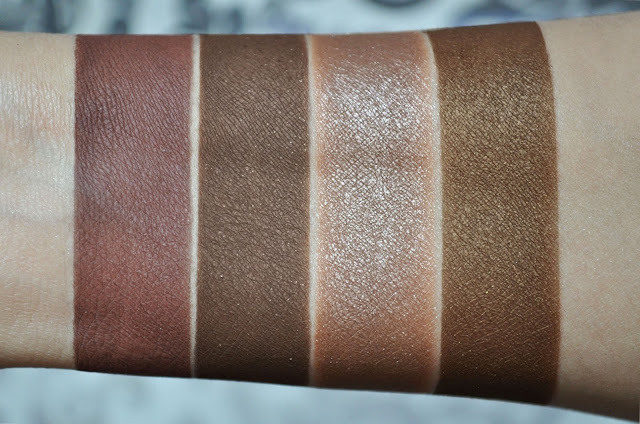 I love seeing your swatches post, they're always so neat! OMG, your swatches are freaking amazing...and may I say BETTER than the very comprehensive swatches from drivel about frivol (but I do love and appreciate her blog of course)! I own nostalgia and I love how gorgeous it is in real life! I totally need more singles from them! Would love Rigoletto and Bagdad Cafe! Wow, now that's a compliment! Thank you (I don't think so), but thank you Sharlynn! Swatching and photographing each arm takes me about an hour. I'm a bit of a perfectionist, so everything has to be a close to right as possible; hence the hour. Looking forward to playing with the new singles. But, their permanent, so I can wait a little longer. Hey BooBooNinja, how have you been? They are more brilliant in person. I just your review style! it is so perfect awesome! want to follow each other? follow me i will follow you back!